One week to Thanksgiving! Once again, Martha Stewart Living is having a Holiday Craft Sale, this year on Saturday, December 4th. I really enjoyed it last year, so I'll sure be going again. And I can't wait to get their December issue packed with exciting, new projects: ornaments made from strings of sequins? Yes, please. Amy Atlas has a very pretty Thanksgiving Crafty Round-up. I want even just a few more days to do all of these. I want to make this sweet, little knit pumpkin I saw over on FlowerPot Designs. How many can I make by next week?! I'd also love to have these felt oak-leaf bowls from Martha Stewart on my Thanksgiving table. And how cute are these paper pilgrim hats? It isn't too early for holiday gift project plans. Over on the purl bee are ideas to get you started on your knitting and sewing: they have the most gorgeous fabrics and luxurious yarns, a lovely way to make your projects even more special. 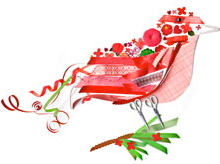 Great array of holiday gift tutorials over at Sew, Mama, Sew with categories for Hipsters, Pet Lovers, Foodies and more. Paper Source has fun holiday card kits. Looking forward to visiting the new Brooklyn location with Koru Kate! And lots of holiday decor patterns over at Lion Brand Yarn. If you're in the NYC area don't miss visiting their beautiful studio. oh, I didn't get a chance to visit the Lion Brand studio. I wish I could have but they are closed on Saturdays. Guess I need to make another LONGER trip! ooo i also have a large list of items to do! be careful with the real tree... with the tub of water you need to keep the tree in and the lectrics.. obv. if you buy a tree that hasnt been cut down but has been grown in a pot you can repot to a bigger tub in spring and actually keep it alive and put it in your garden for next years xmas! Cuz cutting down a tree releases all of co2 that it ever took in and would take another 20 years for a new tree to absorb the same amount. Better for the environment and saves u money!! My last gingerbread house experience ended with a glue gun . . . no lie! Never again :-) Good luck with your holiday list! Let's plan the PS trip soon!! hi flora, yes, i think another trip is in order soon! oh, am a Martha Stewart wannabe! I love all her ideas...too bad am thousands of miles away from her Holiday Craft Sale. Am also too excited about the coming holiday...Christmas has been and will always be my favorite. 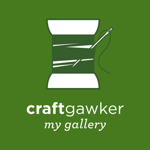 Tons of craft projects lined up so thanks so much for sharing all these wonderful sites! hi aizkim, welcome back, thanks for visiting again :-) looking forward to seeing your projects! hi Helen, thanks so much! hope you had a lovely holiday. thanks, aizkim, i'll have to check that out!